Oh Craigslist, how I love thee. 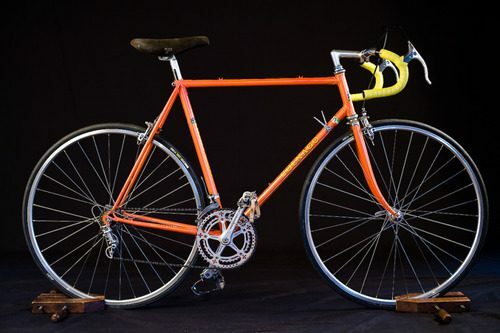 Check out the listing for this 1975 Colnago in Seattle. So funny. Gorgeous bike. Let’s hope this one doesn’t go to Nigeria as well. Ok enough ranting. I hope this is detailed enough for everyone. One of you needs to buy this one. If you are an investment banker – $10K. Just because Dow is over 10K now old boy, and all is so hunky dory and because it would look great next to the gorilla hand ashtray that your father left you as a memento of his first million. If you’re a Google, Microsoft or Amazon Yuppie $5K. Just because all your stocks are going higher every day and because you’d look fabulous on it while you’re going to Freemont to sip your $9 Belgian beer. What, it’s not really $9? Well, you’re in the wrong place, look harder. If you’re a BMW frat boy: 3K. If you had one of these all those hot punk and goth chicks on the Ave that look through you would actually look at you. It’s magic. Some of them might even talk to you so to I’ll throw in two six word phrases that do not contain the words ‘dude’ and ‘cool’ more than 2 times.